Xilisoft DivX to DVD Converter, a professional DivX to DVD burning tool, offers an easy solution to convert DivX to DVD. 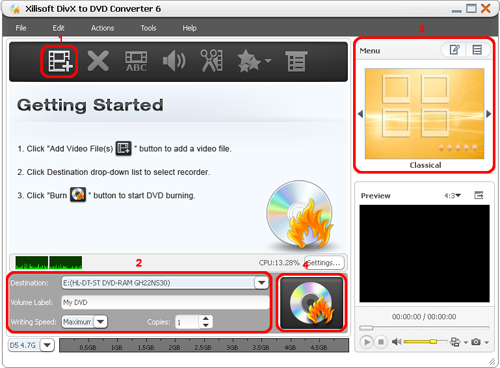 Here is a step-by-step guide to show you how to burn DivX to DVD, DVD folder or ISO image. Before you start, please download, install and launch Xilisoft DivX to DVD Converter. 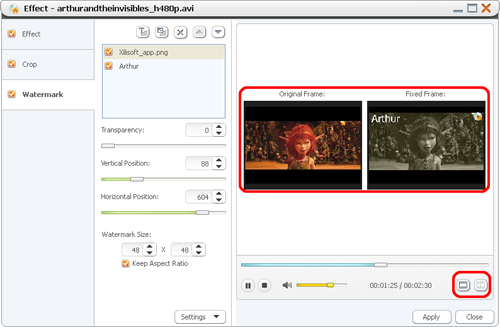 In this part, we will show you the simplest way to create DVD from video files. Click "Add Video File(s)..." button on the toolbar or click "File > Add Video File(s)..." option from the main menu to load the video files you want to burn. Destination: Insert a recordable disc, and choose the disc you insert from the drop-down list. Or choose "Save as DVD Folder" or "Save as Image (.iso)" option to backup your video files onto your hard disk as DVD folder or ISO image. 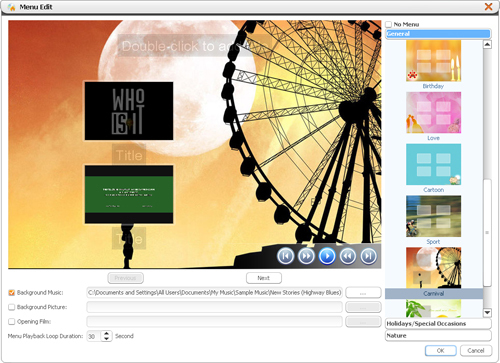 Volume Label: Enter a name in the textbox as the DVD name. Copies: Click the up and down arrows to set the number of copies you want to burn. If you set it to more than 1, then after burning 1 copy, the program will prompt you to insert a new recordable disc. Click "Templates" button on the menu panel, "Menu Templates" window pops up. Choose your favorite template to create a menu instantly. If you don't want any menu, click "No menu". 1. If you want to do more settings with your video file before burning, please refer to "Part 2: Customize Video Files". 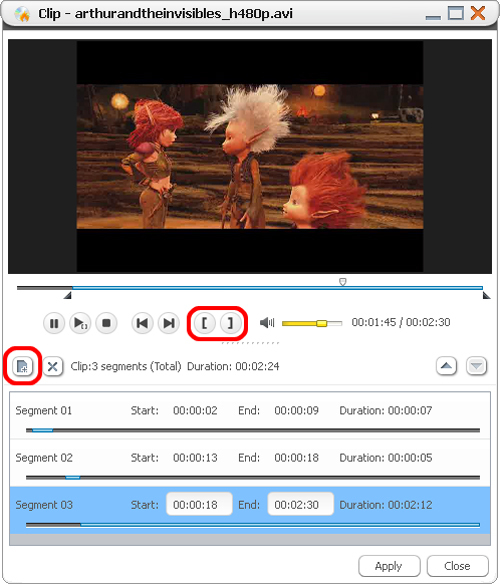 Step 1: Choose a video file in the file list, then click "Subtitles" button on the toolbar to enter the subtitle window, on which click the plus icon on the right panel to choose the subtitle you want to add in the dialog that opens, then the subtitle is displayed in the subtitle list. You can add up to 8 subtitles into the video. Step 5: After adding and editing subtitles, click "Apply" and "Close" to return to the main interface. Click the plus icon before the video file to expand its subtitle items, you will find the subtitles you added are listed below the video file. 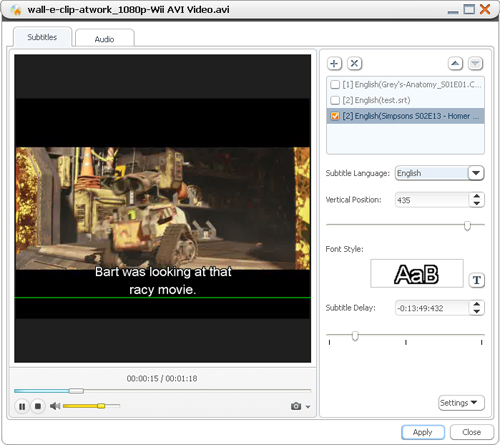 Click the plus icon on the row of the subtitle item to add subtitle in the dialog that opens and the pen icon to edit subtitle in the window above. Step 3: If the audio track is not synchronous with the video, then drag the "Audio Latency" slider left or right to set the latency time, or just enter the latency time in the textbox, or select the time in the textbox and click the up or down arrow to adjust it higher or lower. Step 5: After adding and editing audio tracks, click "Apply" and "Close" to return to the main interface. Click the plus icon before the video file to expand its audio track items, you will find the audio tracks you added are listed below the video file. Click the plus icon on the row of the audio item to add audio track in the dialog that opens and the pen icon to edit audio track in the window above. Step 1: Choose a video file in the file list, then click "Clip" button on the toolbar to open "Clip" window. Step 2: Click "Play" button to play the video, when it comes to the very start point you want, click "Set Start Point" button to set it as the start point, and set the end point in the same way. Then a new segment is added into the segment list below. Step 3: Click "New Clip" button on the left top of the segment list, and repeat the Step 2 to set the start and end point of the segment. Repeat this step to extract as many segments as you want. Step 4: Click "Apply" button to apply the settings and click "Close" button to close the window and return to the main interface. All the segments you extracted will be merged into a new video file in replace of the original one. 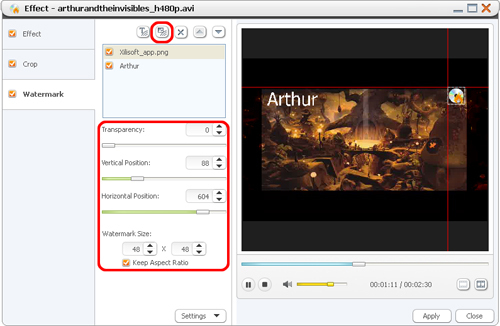 Step 1: Choose a video file in the file list, and click the down arrow of the "Effect" button to choose "Effect" option from the drop-down list, then "Effect" window appears. Step 2: On the "Effect" tab, check the effects you want. Click the up and down arrows to adjust the order of the effects you checked. Step 1: Choose a video file in the file list, and click the down arrow of the "Effect" button to choose "Crop" option from the drop-down list, then "Effect" window appears. Step 2: On the "Crop" tab, enter the height and width below the "Crop Area Size" label, and enter the left and right margin below the "Position of Crop Area" label to set the crop area. Or drag the horizontal and vertical lines on the preview window to set the crop area. And according to your own need, check "Keep Aspect Ratio" option and choose the aspect ratio you want from the drop-down list. 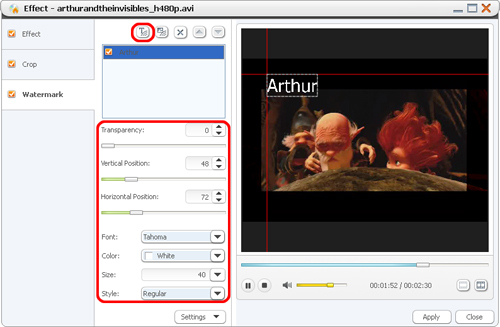 Step 1: Choose a video file in the file list, and click the down arrow of the "Effect" button to choose "Watermark" option from the drop-down list, then "Effect" window appears. Step 2: To add text watermark, please click "Add Text Watermark" button, and input the content of text watermark in the list, and adjust the settings below.